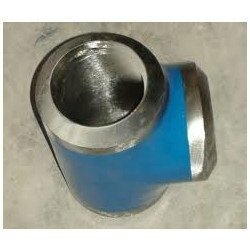 AMTECH Forged Tee and Bar stock TEE with End type : Socket Weld, Threaded (NPT/BSP), and Material : A105, SS 304/316 , Pressure : 2000, 3000, and 6000 Lbs, Size : ½ Inch to 4 Inch , Operation : Precision Dimension Control and superior gauge control by threading with CNC Lathes. - Carbon Steel Forged Tee: ASTM A234 WPB, WPBW, WPHY 42, 46, 52, 60, 65, 70. With our knowledge and experience in this domain we are offering an extensive range of Forged Tee. Our offered product is manufactured using best quality raw material and advanced technology under the guidance of our vendors skilled team. This product is tested on well-defined parameters of quality to deliver defect free range. Duplex Steel Flanges come with excellent corrosion and mechanical strength that make these deliver optimum functionality support as desired by the customers. The presence of superior duplex micro-structure also provides for improved stress corrosion cracking resistance. 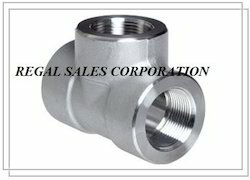 (Seamless & Welded): Equal Tee Socket weld, Equal Tee Threaded, Reducing Tee Threaded, Reducing Tee Socket Weld.